Next April it will have been 88 years since the famous Lutine Bell at Lloyds in London sounded for the overdue ‘København,’ the world’s largest sailing ship and the pride of Denmark’s East Asiatic Company’s mercantile fleet, which had disappeared without trace in the South Atlantic with a crew of 15 seamen and 45 cadets on board. The mystery of her disappearance remains unsolved to this day. 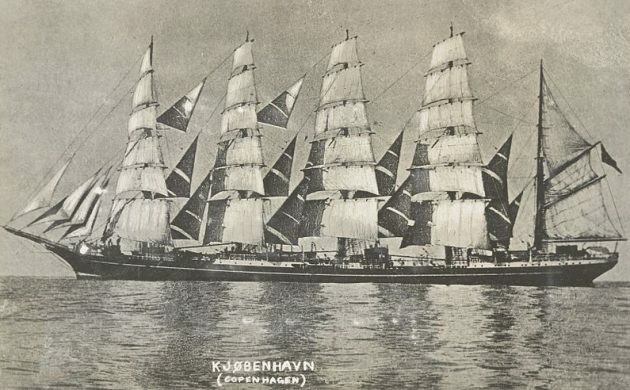 Launched in March 1921 in Leith, Scotland, the ‘København’ was a five-masted, 3,900-tonne sail training ship and freighter powered by a 650-horsepower engine, unique for its time. The last that was heard from the København was a radioed Christmas greeting sent by her skipper – Captain H.F. Andersen – to the Norwegian ship ‘William Blumer’ and the SS City of Auckland, New Zealand on the afternoon of 21 December 1928. The København’s position was then reported to be 900 miles east of Buenos Aires in the South Atlantic. After this she was never heard of again. The fate of the København remains the greatest mystery in the annals of the Danish merchant marine; few clues to her ultimate destiny exist. The mighty ship had left the port of Nørresundby in northern Jutland on 21 September 1928 with 4,300 tonnes of cement and chalk bound for the Argentinian capital of Buenos Aires. The 45 cadets on board were aged between 15 and 20. The København unloaded her cargo in Buenos Aires and took on 1,900 tonnes of ballast. Declared seaworthy by the Argentinian authorities, the ship took on Christmas mail and provisions for 100 days at sea and set sail on December 14 across the South Atlantic for Adelaide, Australia where she was to have taken on a cargo of grain for Europe. The ship’s little radio could reach a radius of only 400 miles. On 17 December 1928 she spoke to the SS Arizona some 400 miles east of Montevideo, Uruguay. Some time elapsed before the East Asiatic Company in Copenhagen began to suspect that some mishap might have engulfed the København. At that time it was not unusual for the company to lose contact with its ships for long periods and the København, with its reserve engines and impressive rigging, was regarded as unsinkable. The board of directors at the East Asiatic Company, fearing that something was amiss with the pride of its marine fleet, called a special meeting in Copenhagen and a 10 million kroner search was launched. A former master of the København, Captain H K Christensen, was put in charge of the investigations. The search for the missing ship scoured an area in the South Atlantic of no less than 1 million square miles. The operation was not without its false alarms: a reported sighting of a ship, resembling the København, in distress off the island of Tristan da Cunha in January 1929 caused hopes to rise, but it turned out to be a Finnish craft. It was on 14 April 1929 that British insurance firm Lloyds’ famous Lutine Bell tolled for the København – but just once. The bell, used only on ceremonial occasions today, was in those days rung once when news of overdue ships reached Lloyds – twice for safe arrivals. Dissatisfied with the East Asiatic Company’s investigations into the fate of the ship, the parents of the 45 missing sea cadets took the matter into their own hands and consulted spiritualist circles in London. ‘Sherlock Holmes’ author Sir Arthur Conan Doyle and his wife were asked to analyse the last letters from the cadets before the København’s departure from Denmark for Buenos Aires. The graphological studies and spiritualist seances that ensued gave only one clear answer to the mystery of the fate of the København’s crew: death by drowning. More down to earth guesses point to the København sharing the same fate as the equally ‘unsinkable’ Titanic only 16 years previously. In all likelihood the ship foundered and sank late at night in fog or a storm, striking an iceberg in the treacherous waters of the South Atlantic.